Dental veneers are a popular cosmetic option for patients who are interested in improving the appearance of their teeth. Cosmetic dentists, like the team here at Shine Dental Arts in Ahwatukee, offer veneers (also called laminates) to patients who are concerned about the aesthetic of either their entire smile or specific teeth. Veneers are extremely thin shells, generally constructed from resin or porcelain. The dentist can customize your veneers to suite precisely the color and shape you desire. 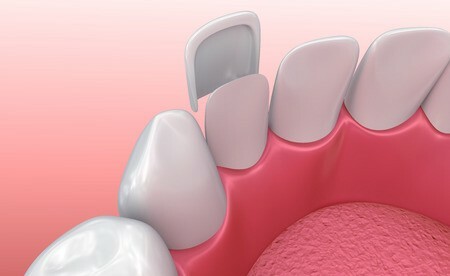 The dentist will then place and bond the veneers to the surface of the patient’s teeth. This process effectively covers broken, misshapen or irregular teeth. Veneers are also often a fantastic solution for discolored teeth that have not responded well to whitening treatments. This means patients with veneers get to enjoy teeth that look totally natural. As an added bonus, this cosmetic dental procedure is also gentle on the gums and difficult to stain. Dental veneers are a minimally invasive option to completely transform your smile. Celebrities who are eager to achieve a whiter and/or more symmetrical smile often opt for veneers as their cosmetic procedure of choice. Miley Cyrus, Hilary Duff and Ben Affleck are only a few of Hollywood’s more famous stars who visited a cosmetic dentist for laminates. Shine Dental Artsi is proud to offer the Ahwatukee community this top-tier cosmetic option, but with an empasis on affordability and accessibility. Veneers could very well be the right choice for you if you are seeking an alternative to crowns or caps. Dental veneers can close gaps between teeth, as well as resolve broken, chipped, irregularly shaped or misaligned teeth. To learn more about veneers and whether they may be the right cosmetic procedure for you, contact the team at Shine Dental Arts for a consultation. What should I expect when I get my dental veneers from my cosmetic Ahwatukee Dentists? Prior to placeing veneers onto your teeth, the dentist must prepare the teeth for bonding. After administering a local anesthetic, the dentist buffs away a tiny portion (about half a millimeter) off the tooth or teeth’s surface. The patient then bites into a mold to create an impression. The dentist sends it to a dental lab, where they will build your custom veneers. When they are ready, another trip to the dentist is necdessary so that he or she can bond and adjust the veneers as necessary. Dental veneers do not require special care. In fact, patients can actually resume brusing and flossing normally as soon as they leave the dentist’s office. Since veneers can require multiple appointments to complete the process, some patients do experience a little sensitivity between visist, as teeth have been reduced and sit exposed. If a patient experiences prolonged discomfort, it is important to contact the dentist as soon as possible. If you still have questions about whether Cosmetic Dentistry is right for you. Give us a call or fill out our contact form to book an appointment. We’re here to help!